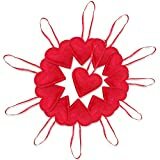 PERFECT GIFT: Our felt heart ornaments will be perfect gift and decor for any occasion: Anniversary, Mother's Day, Birthday, Christmas, Valentines day, Bachelorette party, Wedding and others. It's an amazing gift idea for yourself or your family and friends. MANY USES: These ornaments can be used as Valentine's decor, keychains, backpack charms, wedding favors, hung on Christmas Tree or anywhere you want to add a little dash of love! 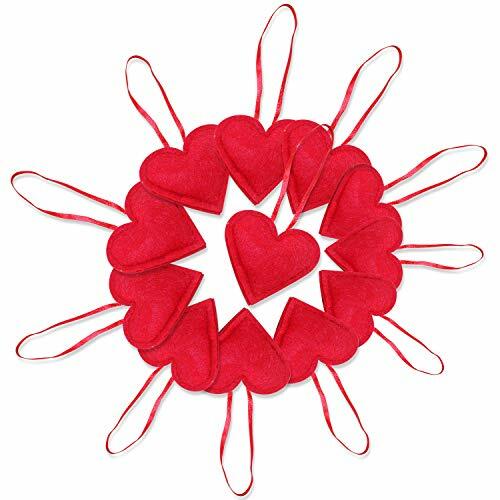 MATERIAL: These ornaments are made of eco-friendly felt in the shape of a heart, made in beautiful bright red. They are stiffened inside with white cotton, sewn with a blanket stitch in matching red floss, and finished with a red ribbon loop attachment. SIZE: Each heart measures about 2.76 "*2.36"(7cm by 6 cm), package include 12 hanging heart ornaments. CUSTOMER SERVICE: We promise full refund for any unsatisfied order, if you have any question, do not hesitate to contact us.